High-quality cotton Tees - rich durable silk screen front and back. 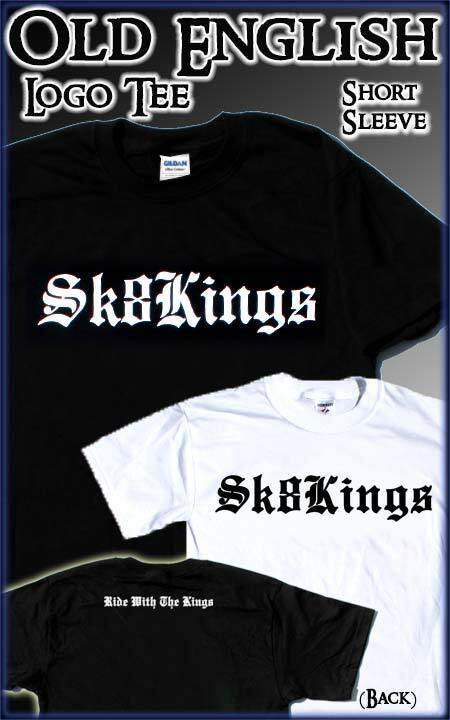 Our popular Old English logo is screened front and center with a back graphic "Ride With The Kings".Choose from black shirt with white screen print or white shirt with black screen print. Available in standard adult sizes S-XXL -- please specify size when ordering. Also available in hoodie fleece pullover or tank top styles. Choose the shirt or hat style under "SAVE $5 - ADD:" option at checkout and specify your choice of logo and size for the second item in the "Notes" section. Subject to stock on hand - logo, size and style.